PASADENA, Calif. (AP) — Stanford’s Bryce Love was considered a Heisman Trophy contender and UCLA’s Joshua Kelley was largely an unknown going into the season. The running backs have had different outcomes to their season going into Saturday’s game at the Rose Bowl. Love has struggled with an ankle injury for most of the season and hasn’t displayed the big-play capabilities that made him of the nation’s top backs. Meanwhile Kelley has emerged as the Bruins’ top offensive player with six 100-yard games. UCLA coach Chip Kelly is not overlooking Love despite the senior having only one 100-yard game and missing two games. 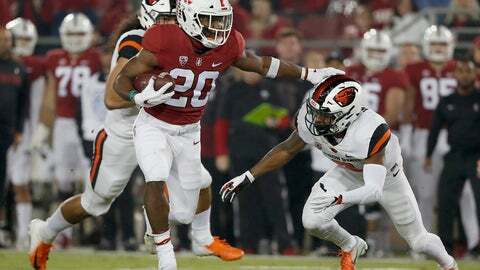 “If you sleep on Bryce Love, you are going to get beat by Bryce Love. We have to be able to contain him,” Kelly said. Love is averaging just 4.8 yards per carry after averaging 8.1 last season. He led the Pac-12 with 30 carries of 20 yards or more last season but has just seven this year. Love is ninth in the conference, averaging 72.5 yards per game. He also appears to be regaining some of his past form with 90 yards on 11 carries in a win against Oregon State on Nov. 10. He had 263 yards and a touchdown last year against the Bruins. Kelley, a redshirt junior transfer from UC Davis, is fourth in the conference in rushing yards per game (118.8 yards per game) and has 11 carries of 20 yards or more. He is coming off a 289-yard performance in last Saturday’s win over USC, which is the most by any back in the long history of the crosstown rivalry. The game will be the season finale for UCLA (3-8, 3-5 Pac-12) while Stanford (6-4, 4-3) faces Cal next Saturday after last Saturday’s game was postponed due to wildfires. STREAKING ALONG: The Cardinal have won 10 straight over the Bruins. Kelly though continues to discount prior history even if that is the longest losing streak in a series in UCLA history. SPEIGHT’S FINALE: Bruins quarterback Wilton Speight, a grad transfer from Michigan, will start his final collegiate game. He came into the season as UCLA’s starter but suffered a back injury in the opener before taking over for the injured Dorian Thompson-Robinson on Oct. 21 against Arizona. Speight has started three of the past four games, but has been extremely accurate in the past two, completing 39 of 57. HAPPY RETURN: Stanford wide receiver JJ Arcega-Whiteside, who leads the conference with 11 touchdown catches, should return after missing the Cardinal’s last game due to an ankle injury. Kelly said that Arcega-Whiteside presents one of the tougher receiver matchups in the Pac-12. ALL ABOUT THE TURNOVERS: Stanford has won all six of its games when it has forced a turnover but is 0-4 when they haven’t got one. KEEP AN EYE ON: Stanford tight end Cody Parkinson. The sophomore tied a school record with four touchdowns against Oregon State and is the first Football Bowl Subdivision with four TDs since Northwestern’s Drake Dunsmore in 2011.